Nail art has caused quite a stir the past few years. It's changed the landscape of Sephora, inspired countless blogs, and has been the source of a unique and immediate bonding between those of us who share and show our passion for fancy tips. Nails are not only to be groomed and masked in dull reds and girly pinks, but, for fashion, they are the opportunity to punctuate a look; what is more: they present the opportunity to function as a statement accessory. My favorite parts of nail art? It's creative, fun, unique, and pretty. The techniques I used for the nail art below include spun sugar (top left), hand-painted with a nail art brush (bottom right), and foil (bottom left). 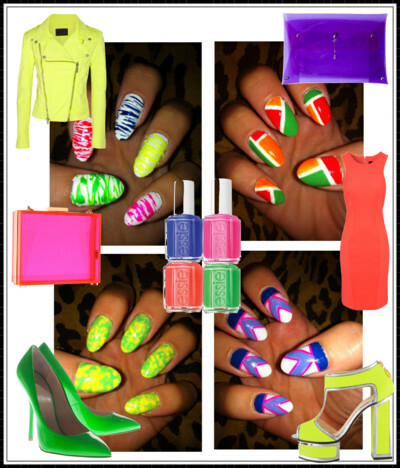 For the design on the top right (I call it Citrus Blocks; it's Essie's Mojito), I simply used the brushes in the bottles and hand-painted it (no tape).